After I have interrupted the royal wedding of Snow White and Prince Charming, Snow is furious. Charming suggests that they ignore me and go on a honeymoon. At first Snow does not believe it is the right time but then has a change of heart and agrees. She suggests they honeymoon at the Summer Palace which is where her parents had gone. As soon as Charming leaves her Grumpy comes to her and tells her the palace is now secure. He asks if she really believes it is a good time to leave. Snow tells Grumpy there is something at the Summer Palace that will help her. Snow and Charming arrive. He immediately tries to seduce his new wife but she puts him off telling him she has special plans for the night. He leaves her alone and she immediately begins digging through a chest and arming herself. Snow tries to sneak away but is intercepted by Charming who knew she was up to something. She tells him of the legend of Medusa. Snow plans to cut off Medusa’s head and send it to me so I may turn to stone. Charming tells her he will come with her. While making their way to Medusa’s lair Charming asks if there is a way to reverse Medusa’s curse. He questions if this is what she would really want for me. They find the home of Medusa. Once inside Snow orders Charming to keep his eyes down. They find Medusa. Snow tries to cut off her head but the only thing that severs is the sword from its handle. They realize this is a bad idea and try to leave but Medusa gets ahold of Snow pulling her by the ankles. Snow becomes free but Charming and Medusa make eye contact and he turns to stone. I channel in on this spectacle through a mirror. I tell Snow she has made my life easier by ruining her own happiness. Snow frantically begins peeling her armor until it becomes a mirror. She lures Medusa and then holds up the armor. Medusa turns herself into stone which frees Charming from the curse. Snow and Charming return to the Summer Palace. She tells him that she wanted me out of the way because she wants a child. She admits that she now realizes there will always be a threat but they have to look for the good moments in between. Belle and Ariel find Prince Eric. He is at work and looks very sad. Once he sees Ariel his sadness is lifted. Belle watches them kiss and feels a sense of sadness for herself. Belle brightens as she sees the pirate ship return. Everyone cheers as we step off Hook’s ship. Granny hugs Henry. Mary is happy to find Ariel there with Eric. 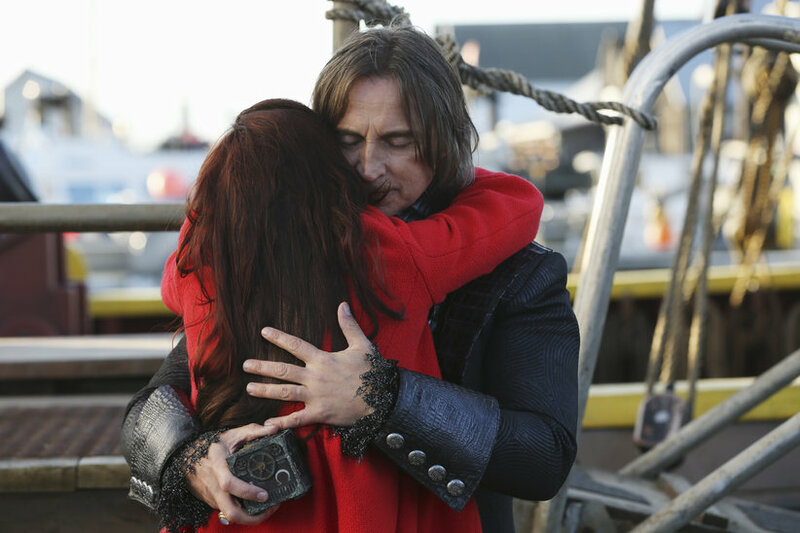 Belle is finally reunited with Mr. Gold. Felix reluctantly gets off the ship. Neal brings his father his walking stick who says he does not need it for now. Wendy is reunited with her brothers. I quietly stand off to the side alone. Mary then points everyone’s attention to me and tells them they could not have done this without me. We are still unaware that Peter Pan has taken over Henry’s body. To gain our trust Pan tells us Felix should be punished. We go to Mr. Gold’s shop. He seals Pandora’s Box in the floor and tells us he will be the only one who can get it out. We reassure the boy we think is Henry that he is safe. Once alone Belle asks Gold what is next. He tells her they will have a future together. They kiss. At the Diner Emma gives Pan the book of Fairy Tales. Emma is taken aback when the boy looks at the book as though he has never seen it before. Pan then smiles and begins flipping through the pages. Hook watches them. Neal sits down next to him. Hook tells Neal he will back off from Emma although he does not believe it will be so easy for Neal to win her back. Mother Superior is surprised to see Tinkerbell and again calls her ‘Green.’ I speak up for Tink and tell Mother Superior to call her Tinkerbell. I then tell her that she should give Tink her wings back. Mother Superior responds that she does not take orders from me. She then tells Tink that she needs to believe in herself first. Neal approaches Emma and asks her on what would be perceived as a date. Emma is reluctant. Neal tells Emma that he will be at the Diner for lunch the following day and if she decides to join him. Once he walks away Mary encourages her to go. Emma tells Mary that she cannot think about dating right now. Pan tells us that he wants to spend the night at my house. Of course I am delighted thinking he is Henry. Once I take him home he looks around Henry’s room. I tell him it is time for bed. He tells me he is still frightened of Pan and wants to know if I brought my vault here so he can use magic to protect himself. I assure him he does not need magic and Pan is buried away. I leave him and he immediately goes to the window and summons his Shadow. David and Mary are having dinner at the Diner. Gold finds them and delivers an elixir to cure David. He tells them there is no price as they are family. David drinks it. He is cured. He kisses Mary. He then brings up having another baby. Mary does not look happy but he realizes she is looking behind him. He sees Neal sitting alone in a booth. David leaves and finds Emma and tells her she should go to Neal. Emma admits there is something not right about Henry. She still senses something bad is coming. David tells there will always be a threat but she needs to look for the good moments. He tells her he will bring her to Neal. Hook and Tinkerbell run into each other. He offers her a drink. Tink tells him she will not be a substitute for Emma. They hear a woman screaming. People run outside and find Pan’s Shadow attacking Mother Superior. They are too late. The Shadow kills her. Hook tells them that this is strange as the Shadow only takes orders from Pan. I hear about what happened and I call for Henry to come with me. No one can figure out how Pan’s Shadow became free. Henry again asks me to help him. We go to leave but Emma stops me. She tells me something is off with Henry. My response to her is that she needs to accept I have been his mother for ten years and always took care of him when he was frightened. I bring Pan to my vault. Emma goes to Gold’s shop. She tells him she needs Pandora’s Box. They drive to the Storybrooke border. Emma wants to open the box and leave Pan on the other side where there is no magic. Gold is reluctant but agrees. He allows Emma to open the box. As soon as the boy is released he looks confused. He sees Emma and calls her mom. The boy insists he is the real Henry and Pan switched bodies with him. Everyone else believes this to be a trick and Gold wants to kill him. Emma begins asking questions. She wants him to tell her something only Henry would know. She asks about the first time they bonded. Satisfied with his answer she lowers the gun. Gold tells Henry he is sorry and Henry assures him he understands. In the vault I see my son looking around. I don’t know what he is looking at. He tells me how lucky he is to have me to protect him. We hug and I tell him how much I love him. Pan opens a bottle that knocks me unconscious and responds by telling me that is what made it so easy. Emma tries calling me and cannot reach me. She heads the vault with Mary, David and Gold. They find Neal there with Hook and Tinkerbell. Neal hugs Henry as he tells his father the vault is sealed. Gold tries to use magic to open it but realizes this is tricky. Emma admits to her parents that she will never have a day of happiness as the savior. Gold is finally able to open the vault. Inside there is no sign of Pan but they do find me. Gold revives me. I am ashamed as I admit I wanted to believe everything the boy told me. I am surprised when I see Henry in Pan’s body. Henry comes to me and hugs me. Gold figures out that Pan stole the curse. We try to figure out what he would want with it. Pan frees Felix. He tells him once he casts this curse they will be in control this will be the new Neverland.